The automobile has a very particular place in American culture. It’s central to countless films and novels, helping to drive (sorry) the narrative. Though cars do appear in art – in photography, painting and sculpture – they are less prevalent here though from the minimalist sculpture of the mid-twentieth century onwards there was certainly a clear interest in using industrial processes and making work that defied expectations about the nature of sculpture in particular. Expectations about painting had already been shattered by minimalism and abstract expressionism. 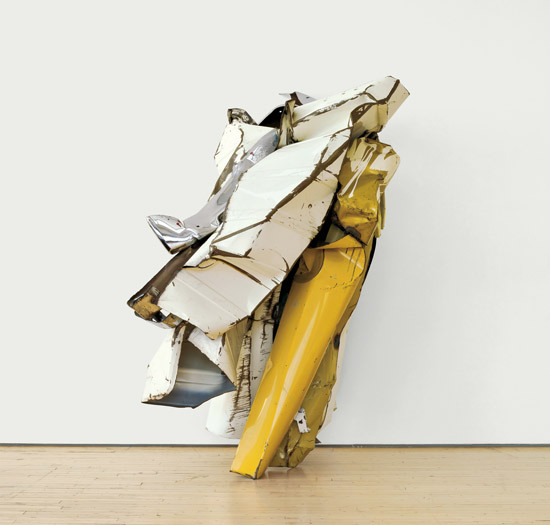 In John Chamberlain’s sculpture, the automobile becomes physically part of the work but is often physically transformed by the act of making. These are degraded cars, no longer capable of transporting us across the country but, in their own way, taking us on another journey instead. 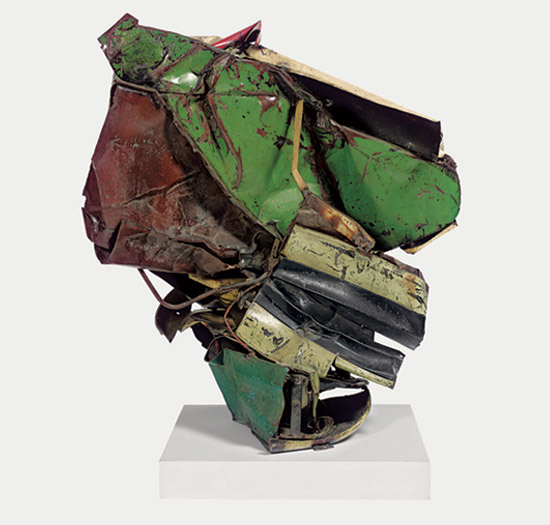 Chamberlain used cars as art materials, breaking them apart and making assemblages from the bashed about remains of vehicles that have seen better days. Though these are sculptures they could also be seen as action painting made three-dimensional. Using the colours of the cars he worked with means that the works are sometimes subtle, sometimes garish, but always deliberate and at odds with prevailing ideas about sculpture; the titles add an extra dimension to the work. Though the sculptures are abstract the titles suggest a level of figuration and lack the dry seriousness of more conceptual works of the time. Chamberlain’s retrospective at the Guggenheim, shows his work to excellent effect. The sculptures sit well in the spiral gallery space; they are the right scale and the freestanding ones can be seen from all angles. The variation in scale of the work on show is interesting and the works are surprisingly beautiful. 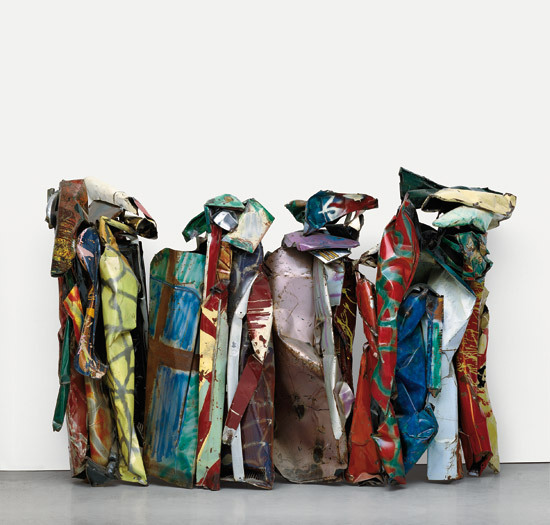 It would be easy to see Chamberlain’s sculptures as random amalgamations of sheet metal sourced from scrapyards – as car crashes, even – but the title of the exhibition – Choices – suggests a more selective approach; indeed, Chamberlain himself said “Some seem to think that I work with found pieces, but I don’t. They’re chosen, you see.” On the whole, some of the later works notwithstanding, he chose well. 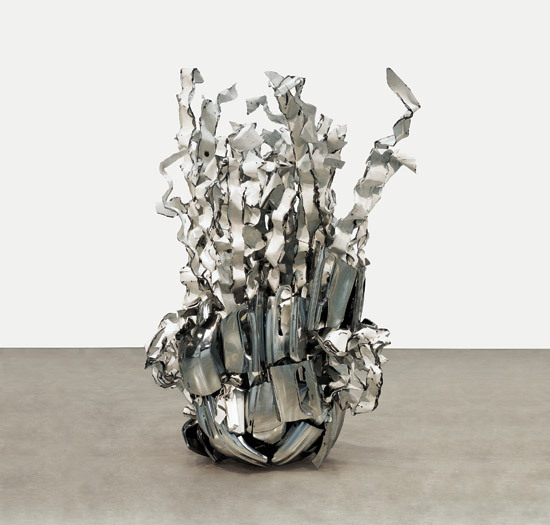 John Chamberlain: Choices is at the Guggenheim Museum, New York until 13 May 2012. This entry was posted in Collage, Sculpture and tagged art, assemblage, Choices, Gluts, Guggenheim, John Chamberlain, New York, Robert Rauschenberg, sculpture by Ann Jones. Bookmark the permalink.